It's often said that the ability to shoot at will with digital cameras, with only the enormous capacity of a memory card to worry about, is often blamed for taking the craft out of photography. And perhaps more people subscribe to this view than you might think, as an app that turns your smartphone into an accurate simulation of a disposable Kodak camera has proved to be an unexpected hit. Gudak Cam, now available on the iOS store, only lets users shoot 24 images at a time. Once they’ve run through their 24 exposures, they have to wait an hour to reload the ‘roll of film’. They then have to wait a further three days for the roll to ‘develop’ before they can see their results. Who, you may ask, would be interested in that? Well, it turns out quite a few people, especially young women in South Korea and Japan. Nikkei reports that high-school students in both countries are enjoying both the retro feel of the app and the anticipation of waiting for their ‘films’ to develop. Some analysts in South Korea have said that people are weary of digital capture, and are looking for an experience less frenetic and instantly gratifying than provided by social media. 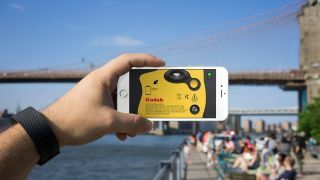 Users can burrow further into the nostalgia niche if they want to, as Gudak Cam can add light-leak effects into images, as well as the kinds of colour casts commonly associated with disposable film cameras. The app’s name comes from a Korean term ‘Gudagdali’, meaning ‘outdated’ – and appropriately enough, the word itself is also rather outdated, and not in common usage. Screw Bar, the company responsible for the app, says it's aiming to bring back the thrill of choosing and cherishing moments. And yes, they refer to it as a ‘Gudak Moment’. iOS users can head over to the Apple store to try Gudak Cam out , with the app available for $0.99 (£0.74). Visit Screw Bar’s website for more information.